FREE for as long as this website continues, or until Jesus comes again! Directory Listings JPEG Image Graphics Enhance Your Listings. *We are able to create graphics, but this must be discussed. There is usually an additional charge for doing so. and Get 3 Months for the Price of 1. *PLEASE NOTE: YOUR 1st MONTH 'PREMIER' (SEARCHABLE) LISTING IS ALWAYS FREE AND IS COUNTED IN ADDITION TO ANY CURRENT LISTINGS PROMOTIONS YOU MAY DECIDE TO PARTICIPATE IN. Example*: If you take advantage of this "Buy 1-Month, Get 3 Months for the Price of 1" promotion, and are submitting your first request for a 'Premier' (SEARCHABLE) Listing, you not only receive the 3 months for the cost of 1 month, but ALSO the 1st month FREE INDEED. Effectively, you receive a TOTAL of 4 MONTHS (and you only pay for 1 month). You can't beat this value anywhere else for your business, organization, skilled service/labor provider, special talent, church, ministry, and mission advertising needs!! Events Listings JPEG Image Graphics Enhance Your Events Listings. *Banner Placement May Vary Unless Otherwise Specified. * Banner Placement May Vary Unless Otherwise Specified. There is an additional charge for doing so. Unless otherwise agreed, the client must provide all required content. Contact Us About Other Discount & Promotional Offers. 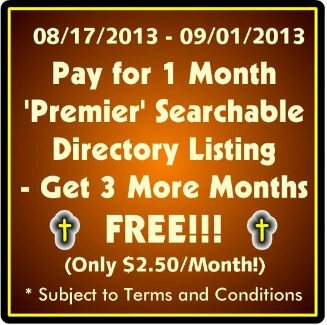 TheChristianDirectory.Net offers a broad spectrum of affordable advertising options to serve the Christian demographic. Begin by adding your FREE listing, then check out our paid web advertising options. We also offer special advertising and pricing for things like Christian events, job postings, resumes/curriculum vitaes. A variety of other personal and classified advertisements may be possible by contacting us online. Dont Wait Until It's TOO LATE! Get Listed Now!! !